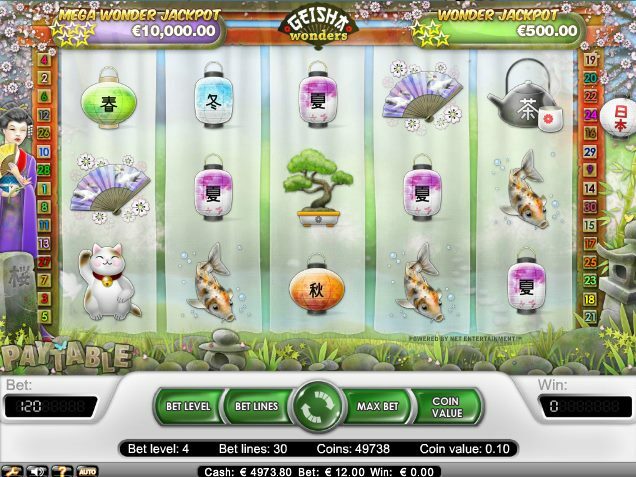 With some beautiful graphics on-screen, a few colors straight out of a designer's pastel color pencils set, and not one but two progressive jackpots, Geisha Wonders could be the Asian-themed online slot you've been looking for. The two big prizes on this 5-reel, 30-payline NetEnt slot - the Wonder Jackpot and the much larger Mega Wonder Jackpot - are awarded by landing stars on the reels. The Wonder Jackpot can be won by hitting four of the jackpot stars on a pay-line while the much juicier Mega Wonder Jackpot is yours if you can land five stars. If you've played Microgaming's wonderful Asian Beauty game - probably this slot's closest cousin - you'll recognize the symbols. The theme is Japanese and the world of the Geisha - female 'companions' whose tradition goes back centuries in Japan. Geishas are hostesses who traditionally play music, dance, cook and entertain men. As this slot is steeped in Asian imagery, as you'd expect the reels are packed with relevant symbols. So, we get plenty of paper lanterns, Koi carp, a Bonsai, a teapot, fan, and a china cat. 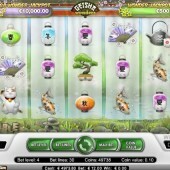 The top payer is the cat, paying a 1,000-line bet jackpot, but the big bucks in the base game are reserved for the Wild. The substituting symbol in this case is the Buddha statue, and other than replacing regular and jackpot symbols it pays out a nice 10,000x your line bet jackpot when you hit five symbols on the reels. The beautiful Geisha - as you'd expect - is a Bonus Scatter, with three or more anywhere on the reels triggering 10 free spins. If 10 doesn't sound too good, that's the minimum you will win - 20 spins can be yours if you land four Scatters and 30 spins can be won if you hit five Scatters. There's also a 2x multiplier on all free spins wins. A generous free spins round would be enough in most games - but as mentioned, those two progressive jackpots lift the slot above the norm. Asian Beauty almost comes close to this game, but if you're in the mood for some more Oriental-themed slots, check out NextGen Gaming's Emperor's Garden with plenty of stacked icons.